I come from a long line of "figure out-ers," plus spent a couple summers working at a hardware store, so when a household problem crops up, we usually head to the closest Home Depot and buy the parts of the solution. 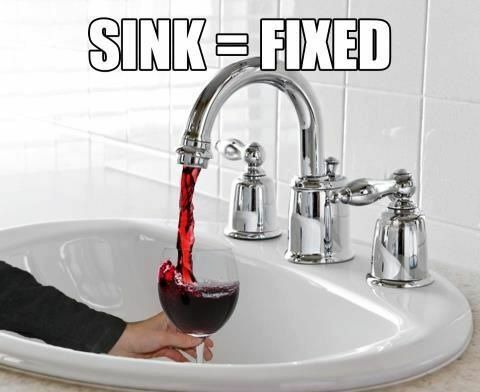 Recently, we decided the rapidly escalating drip out of our bathroom faucet needed to be fixed. Since we weren't sure how to fix the faucet itself, we decided we would replace the entire faucet. Then the drip got really bad, so I reached under the cabinet to use the shut off valve, which then started leaking more than the faucet. Dang! Then snowpocalypse happened. We were justified in ignoring the problem for a few more days, because it didn't make sense to start the project with no hope of getting more parts from Home Depot. Finally, it could be ignored no longer. In we dove, with only some assumptions, some tools, new shut off valves and no actual plumbing experience. After a couple hours, we were rapidly approaching midnight and hadn't gotten very far. We could get at least once valve on (so that we could turn the water back on to the house) but we had made the sink even less functional than when we started. 1. Personal pride. I mean, he flies airplanes and I used to be an air traffic controller, surely we could do this! 2. Ugh, plumbers. It always ends up taking your entire day waiting for them to arrive and then their price quote is 5 times what you expected. Finally, and thankfully, I remembered to try texting an awesome handy man that we've gotten to know (and love) lately. Unbelievably he answered right away and could come the next morning. Even better, he loves to communicate by text, and asked for pictures so he would know what he was getting in to before he arrived.